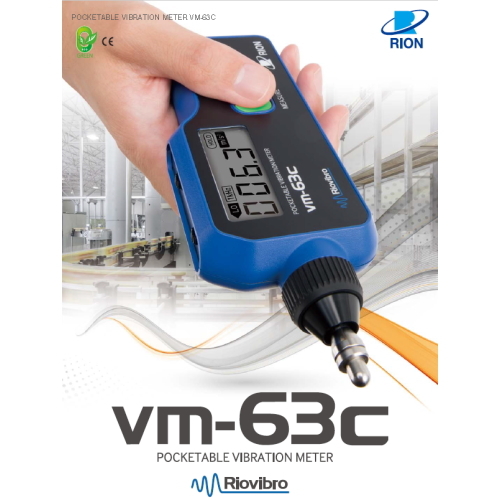 The VM-63C is a highly compact vibration meter designed mainly for maintenance and inspection of industrial machinery, with particular emphasis on rotational machinery. 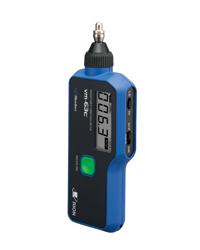 The integrated accelerometer and digital display eliminate any need for cables, making on-site measurements in the field easy and quick. The unit can be held in one hand and operated with a single button, combining superb convenience with complete reliability and dependability. ・Simply by holding the unit against the target object, measurement over a wide range of vibration frequencies is possible. ・LCD readout shows either acceleration (m/s2 Peak), velocity (mm/s RMS), or displacement (mm P-P). ・Measurement for unbalanced conditions, misalignment (low vibration frequency range) or bearing vibrations (high vibration frequency range) is also possible. 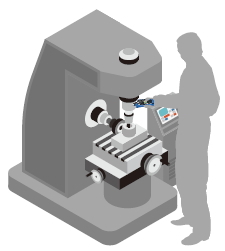 ・Wide-range design eliminates the need for frequent measurement range switching. ・A power switch is not needed. Pressing the MEASURE button turns the unit on, and power shuts down automatically after a period of inactivity. 1. Press the MEASURE button to turn the unit on and hold the vibration detector against the measurement object. Use a pressure of about 500 g to 1 kg. 2. While the MEASURE button is being pressed, the vibration value is shown on the display. 3. Releasing the MEASURE button causes the vibration value at thatpoint to be held on the display for easy reading. 4. Pressing and holding the MEASURE button again causes measurement to be resumed, allowing repeated measurement. 5. If no other operation is performed for 60 seconds, power will automatically be turned off.